Being a teen can be challenging these days. Come in, get some pampering, education, the do’s and don’t of skin. This facial will focus on problematic skin for young ladies and gents 18 and under. This facial is to guide your teens into healthy habits that will carry out the life of their skin care journey. Our signature facial will customize all products for your skin type and concerns. This is a European relaxing facial treatment. Skin will sparkle and feel instantly firmer as peptides and antioxidants tone the skin. This brightening gentle enzyme facial will leave you smooth with a glowing radiance. Also can be customized for a mommy to be. Cleansing, exfoliation, mask, massage, hydration, eye & lip treatment. This safe procedure is designed to not only exfoliate the epidermis by removing the dead skin cells, but also removes the fine facial vellus hairs to achieve a smoother and brighter complexion. It also prepares the skin for enzymes and peels. This is done mechanically using fine surgical steel blade. You will receive cleansing, exfoliation, hair removal, custom serums, SPF hydration. This led light focused facial is customized for you whether you have blemished/acne prone skin or wanting an anti-aging boost. Whatever your skin concerns are this facial has you covered. The illumination facial has everything our signature facial has including led light therapy. Using advanced technology to exfoliate and refine the skin with a diamond tip, gentle vacuum and specific product infusion this facial will take your skin to the next level of glow. Say goodbye to abrasive old school crystal microdermabrasion and hello to gentle infusion exfoliation of your skin. Everything used in this facial will be customized for your skin type and concerns. The Purely K ultimate facial blends the best of everything in one facial for amazing results. This facial includes skin analysis, microsonic cleanse, hydrodermabrasion, facial massage, micro-current treatment, hydro jelly mask, eye and lip treatment, 20 min led light, custom serums, hydrators and spf. Ideal for men or women. This is everything your skin has ever wanted and more. Get ready for that glow. Chemical peels are a procedure that aims to accelerate skin exfoliation by the use of chemical formulations resulting in renewed, healthier looking skin and more uniform complexion. Peels are customized to address the visible skin imperfections that result from skin aging and sun exposure, such as fine lines and wrinkles, uneven skin tone and texture. Peels also address skin tone unevenness that can be caused by acne scarring or pigmentary changes. I offer a range of different strength peels that I can select to provide the optimum treatment for you. I carry Cosmedix & Cosmedix Elite, VI Peel, and Rhonda Allison peels in three levels of strength. The number of treatments is based on initial level of skin damage, and can vary from 3 to 6. You may receive a peel depending on the strength every 2 to 6 weeks until desire results are achieved. Please call for a free consult to design a package to fit your desired result. Packages of 3 or more peels available. Wavelengths of red or blue light help improve skin’s barrier function by improving its ability to retain key elements it needs to heal and generate new collagen after its production has slowed due to age or cumulative damage. This process speeds up wound healing, promote circulation and reduces inflammation, fine lines and wrinkles. In addition to patient testimonials, clinical research has been conducted by NASA and this treatment is FDA Approved. To achieve noticeable results with LED Light Therapy, a series of treatments along with a proper maintenance program is essential. Much like working out, the more you use LED Therapy, the better results you will gain from it, consistency is key! Most treatments require 8-10 sessions to see noticeable improvements to the skin. This express treatment is to be done every 2 weeks to get ahead of pesky acne, perfect for inflammatory and non inflammatory acne. Any where from 3-10 treatments until the break outs are under control topically, while the internal is being addressed. Custom enzymes/acids will be picked accordingly depending at what stage the acne is at. 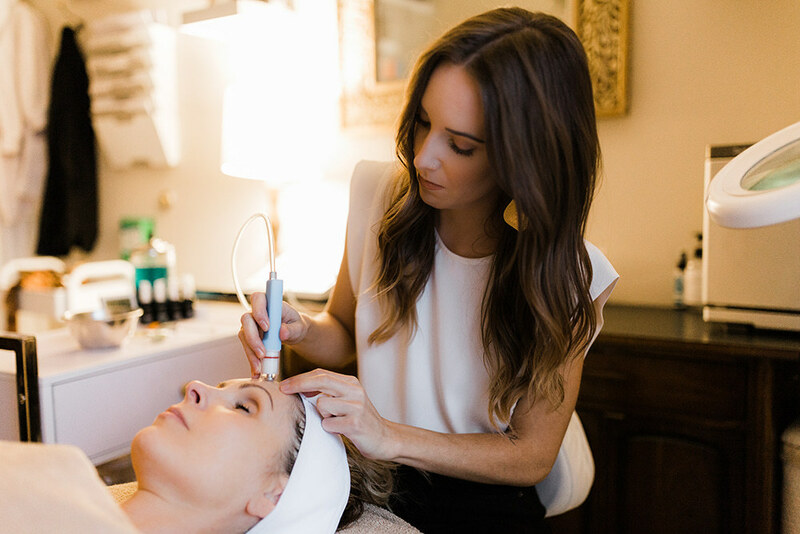 Microcurrent technology is the application of current through the skin at a cellular level to lift and tone muscles, smooth wrinkles, stimulate collagen production and slow the aging process of cells. Think of this as a workout for your face muscles. This is a safe and relaxing process with immediate visible results and no down time. GREAT for all skin types. Looking for a treatment to soften fine lines and wrinkles? Plump and brighten the skin? It’s here! Sculplla facial filler mask! Sculplla drives an ingredient called Poly L Lactic Acid- the same ingredient in the filler sculptra, as well as growth factors, caffeine, niacinamide, into the top layer of your skin through your hair follicle to plump the skin. No down time other than to avoid sweating or water to the treated area for 12 hours. This wonderful treatment duo of hydrobermabrasion and micro-current will have you glowing lifted and toned for your special event. Perfect to do 1-2 days before event. Feel great in your skin after this service. Micro-needling is an innovative procedure that effectively promotes the skin’s ability to heal and rejuvenate itself under the right circumstances. It can improve fine lines, and wrinkles, skin texture, acne scars, stretch marks, firm and lift. This micro-needling procedure includes cleansing, balancing, and multiple serums. Also included are those amazing growth factors, a recovery balm and finishing with a red LED light treatment to accelerate recovery and reduce inflammation. A post-care home recovery kit valued at over $50 is also included. This is the complete micro-needling procedure! Bump up your results and healing time with Platelet Rich Plasma. PRP is a concentration of platelets in the blood that are crucial to wound healing. PRP releases growth factors into the skin to expedite the body’s own repair process & stimulate new collagen & elastin up to 1000% more by using your own natural platelets. You will receive the full micro-needling procedure with the added benefits of PRP. Purchase a package of 3 or more procedures with or with out PRP and receive 20% off in addition to a post-care home recovery kit valued at $223 for your series. Have a question? Message us!